We’re very excited to announce that NeoRouter Free v1.1.1 is now available for download. Since the NeoRouter official build has been released two months ago, we’ve received a lot of good suggestions and feedbacks. So we work hard and try our best to meet those requirements. Now, we have the latest build of NeoRouter Free. One of the most popular requests is the Mac GUI for NeoRouter support. We have released CLI for Mac for a while, we also have the third party GUI tool – NRClientX, but it’s still a pain for most Apple users, who want to use NeoRouter on Mac OSX just like on their Windows machine. 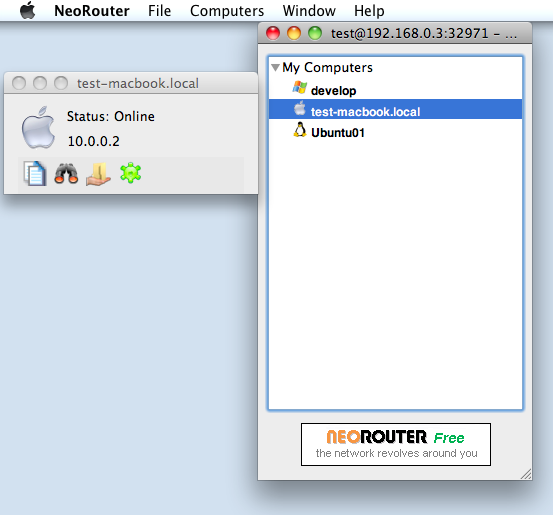 Now we ported the NeoRouter Network Explorer to Mac OSX. Though it’s the first version, it supports the same features as the counterpart on Windows, including computer list, add-on support, add/delete computer, add/edit/delete category, add-on manager, add-on quick launch pad, connection option settings and etc. Another pain we solved in this build is the OpenSSL lib dependency issue on some Linux distros. We received reports that NeoRouter complains about the imcompatible OpenSSL libs and our users have to either create symbol links or find out/install the proper libs. We improved the libraries in this build and there is no need for the dyanmic OpenSSL libraries anymore. It means you can install it on almost any Linux distros. We also fixed a couple of bugs and issues, such as hair-pin issue and so on. Next step – we are busy on the smartphone support. The Android version will be available in a couple of months. iPhone version is in our schedule as well. Thanks for everyone’s continued support for NeoRouter! Let us know what you need and we will do it.